Described as "the most beautiful place in the world at sunset" (by Winston Churchill no less! 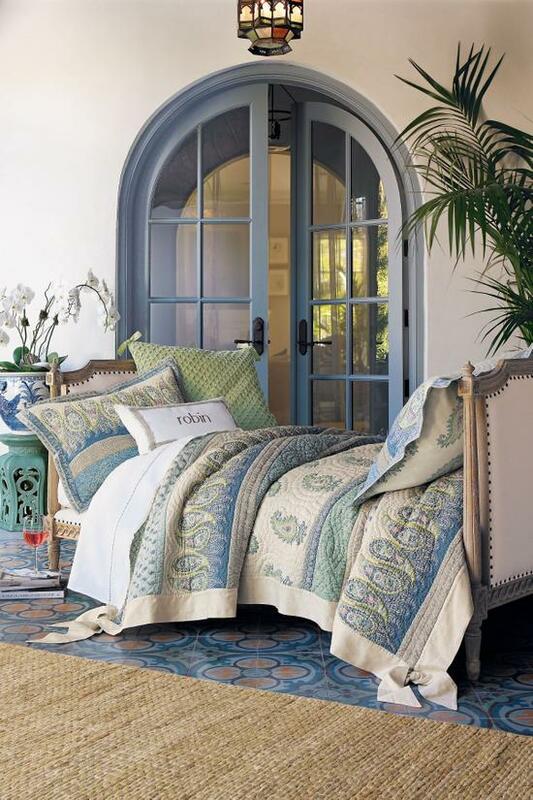 ), Marrakesh still inspires, day or night, through the tranquil colors, patterns and touch of our Marrakesh Express Quilt. Fashioned in cotton and linen, finished with soft, gentle appeal, then adorned with a generous flange and self-tie corners to confer a bit of vintage flair. 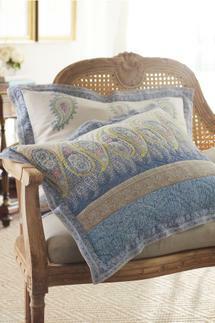 The Marrakesh Express Sham is quilted in pattern on one side, paisley printed on the reverse. All sides are framed in the border-print flange. Full-width zipper closure at bottom back. Cotton batting fill. Machine wash cold, Only non-chlorine bleach when needed, Tumble dry low,Cool iron if needed, Do not dry clean.